While clean and debris-covered glaciers show many similar features within their landsystems, they differ in the dominant processes operating at the ice margin and in the relative development of landforms (Figs 15.4 and 15.5). Figure. 15.4 A landsystem model for valley glaciers with relatively low supraglacial debris inputs. (From Benn and Evans, 1998). 1= Supraglacially entrained debris; 2 = Periglacial trimline above ice-scoured bedrock; 3 = Medial moraine; 4 = Fluted till surface; 5 = Paraglacial reworking of glacigenic deposits; 6 and 7 = Lateral moraines, showing within-valley asymmetry. Moraine formation at glacier margins with limited supraglacial debris involves one or more processes, including pushing (particularly where the margin is buried by glacifluvial deposits or debris flows), dumping of supraglacial debris, and, where fine-grained saturated sediment is present at the margin, squeezing (Benn and Evans, 1998). Thrust moraines may form where glaciers come into contact with thick, unconsolidated sediments such as glacimarine clays and silts (e.g. Gray and Brooks, 1972; Benn and Evans, 1993). Moraines are typically less than 10 m high, but size is strongly influenced by catchment lithology, debris availability and glacier dynamics. In valleys underlain by resistant crystalline rocks, lateral moraines may be little more than boulder lines. Giant lateral moraines are common along the margins of glaciers with large discharges of debris in high-level transport and poor linkage between the glacial and proglacial transport systems. Such moraines represent major sediment sinks, with distal slopes 100—300 m high near the terminus. Lateral moraines extend from the contemporary equilibrium line as continuous, sharp-crested ridges that increase down-glacier in cross-sectional area. 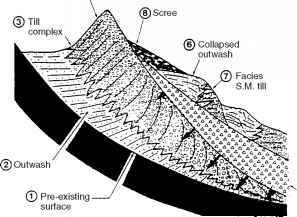 In the upper ablation zone, moraines may have little or no distal slope, being effectively a debris veneer accreted onto the valley side. Down-valley, moraines become increasingly separated from the valley wall, forming lateral morainic troughs (Hewitt, 1993; see below) which act as traps for glacifluvial sediment and slope debris derived from the valley side. 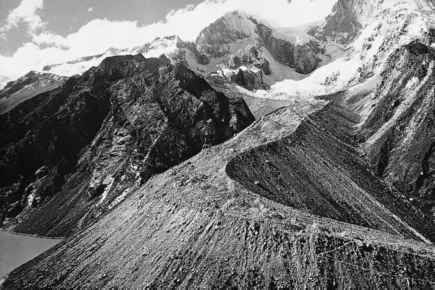 Figure 15.6 Hatunraju Glacier, Cordillera Blanca, Peru - a debris-covered cirque glacier on a raised bed terminating at a large moraine dam. (Photo: C.M. Clapperton). supply is sufficiently large, accumulated debris around the glacier margin constitutes a major barrier to glacier flow, preventing forward advance of the glacier during periods of positive mass balance and forcing the margin to thicken in situ. In turn, this focuses more deposition on the moraine, creating a greater impediment to glacier advance. Large lateral-frontal moraines are formed as debris falls, slumps, slides or flows down the ice edge and accumulates around the glacier margin (Humlum, 1978; Small, 1983; Owen and Derbyshire, 1989, 1993; Owen, 1994; Benn and Owen, 2002). A depositional model has been presented by Owen and Derbyshire (1989, 1993) and Owen (1994), who termed it the Ghulkin-type association after the glacier of that name in the Karakoram Mountains (Fig. 15.5). If the glacier margin remains in a stable position, the accumulation of dumped material produces a wedge-shaped moraine with crude internal bedding dipping away from the glacier at angles between 10° and 40°. Facies consist of stacked diamictons with variable clast content interbedded with thin sand and gravel layers reflecting intermittent glacifluvial deposition and reworking (Figs. 15.7 and 15.8). 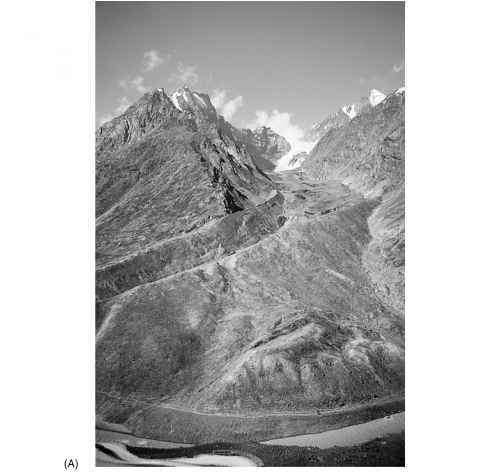 Figure 15.7 Diamicts interbedded with gravels and sands exposed within a large lateral moraine complex, recording deposition from mass movements and meltwater, and within ephemeral ponds in sections in the Hunza Valley, Karakoram. The largest boulders are ~ 1m in diameter. Figure 15.8 Schematic internal stratigraphy of large lateral moraines. (From Boulton and Eyles, 1979). 4. rounding and comminution of clasts in shear zones within the glacier (Glasser et al., 1999). The ice-proximal parts of lateral-frontal moraines tend to be structurally complex because of widespread collapse and reworking following the removal of ice support. Bedding is commonly contorted as a result of the melt-out of buried ice and gravitational reworking. Individual facies may be hard to distinguish but subglacial tills, including melt-out tills, may be recognized. Diamicts may be interbedded with supraglacial lacustrine and glacifluvial sediments, which typically form deformed channel fills. As noted above, the termini of debris-covered glaciers may repeatedly occupy similar positions in a valley. 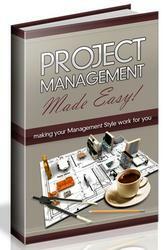 Consequently, moraines may undergo several aggradational episodes separated by periods of erosion or non-deposition. The old moraine crest may be completely buried, or a new inset moraine may be formed within the older one, forming multi-crested lateral moraine complexes. Complex depositional histories may be preserved in the internal structure, in the form of multiple depositional sequences bounded by erosion surfaces (Boulton and Eyles, 1979; Small, 1983; Richards et al., 2000; Benn and Owen, 2002; Fig. 15.8). Periods of non-deposition may be recorded by palaeosols or even buried trees, providing a valuable source of palaeo-climatic data (Rothlisberger et al., 1980; Rothlisberger, 1986; Grove, 1988). In many mountain areas, moraine chronologies demonstrate repeated superposition by successive advances over millennia, often over the entire Neoglacial period since c. 5 ka BP. It is probable that at some glaciers, giant moraines store the entire Holocene yield of coarse sediment from the catchment (Lliboutry, 1986). Following glacier thinning and retreat, lateral-frontal moraines are abandoned and their inner faces subject to collapse and paraglacial reworking (Blair, 1994; Ballantyne, 2002b, Chapter 17). Inset moraines will therefore be unstable and short lived, particularly if they are deposited on top of dead ice masses. The presence of thick supraglacial and ice-marginal sediments means that subglacial landsystems are rarely exposed on the forelands of debris-covered glaciers. 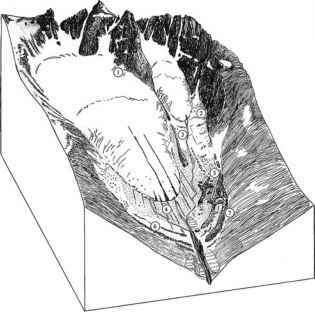 The existence of deeply incised glacial troughs and the presence of striated, actively transported clasts in lateral-frontal moraines, indicate that subglacial erosion and transport must be effective, although it is likely to be volumetrically less significant than supraglacial debris entrainment and transport in most basins (Small, 1987a, b; Gardner and Jones, 1993). Lateral-frontal moraines in Ghulkin-type landsystems form continuous ramparts around the glacier margin. Such landsystems tend to develop where meltwater discharges are low relative to debris fluxes and where the moraines are formed predominantly by mass-movement processes. 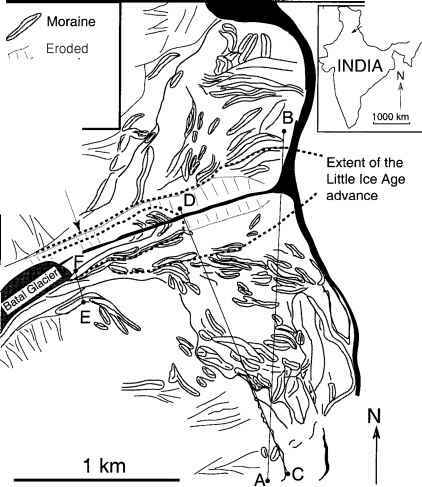 Where meltwater discharges are higher (such as in the monsoon-dominated environments along the southern slope of the Himalaya), glacifluvial processes keep open a central corridor, preventing a continuous moraine loop from forming (Fig. 15.9). Glacifluvial deposition in the proximal proglacial zone forms fans of gravel and sand, sometimes interbedded with diamictons (debris flows and hyperconcentrated flood-flow deposits). Breach-lobe moraines have not previously been recognized as a distinct landform. They form as inset loops or lobate moraines where a glacier exploits a gap in a major moraine ridge, either in lateral or lateral-frontal positions, and they may evolve either into large superposed moraine complexes or into accreted suites of individual ridges. Sedimentologically, they are identical to the moraines adjacent to the breach. Multi-lobed glaciers such as Miage Glacier, Italy (Deline, 1999a) and Sachen Glacier, Pakistan (Shroder et al., 2000) owe their terminus morphology to a long-term expansionary tendency and repeated breaching of the main moraine barrier. 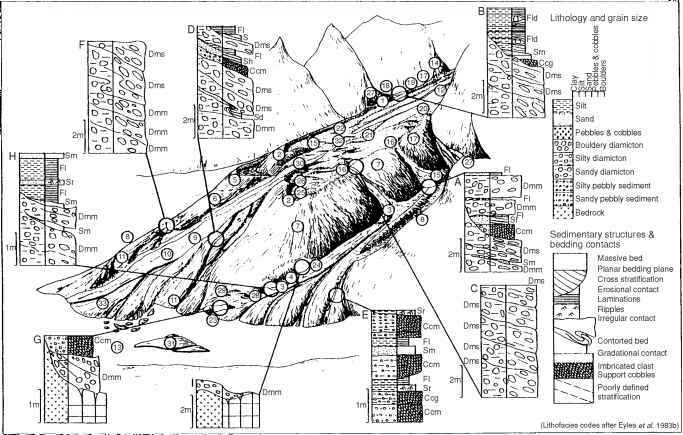 An explanation of the formation of secondary lobate termini is provided by the moraine-breaching model of Lliboutry (1977), which explains the unusual morphology of Glaciar Hatunraju in Peru (Fig. 15.6). At Miage Glacier (Italy; Fig. 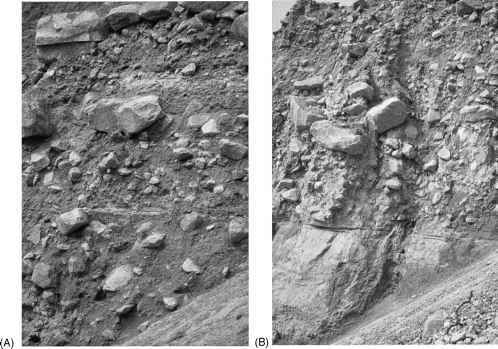 15.10), three phases of breaching have punctuated phases of lateral moraine construction (Deline, 1999a, b). The earliest breach dates from c. 2300-2900 BP, when seven moraine ridges formed before the main lateral moraine sealed the breach by 1250 BP (AD 700). A second set of breach-lobe moraines represent glacier expansion in the c. 8-11th centuries AD, again followed by lateral moraine construction, before final breaching beginning in the early 17th century deposited at least ten breach-lobe moraines before AD 1930. At Tasman Glacier (New Zealand), breaches in the lateral moraines formed much earlier and have evolved into broad embayments in the lateral moraines (Kirkbride, 2000). One embayment (Fig. 15.11) has evidence of four expansionary phases since c. 3700 years BP, the latest representing the 'Little Ice Age' and culminating at c. AD 1860. 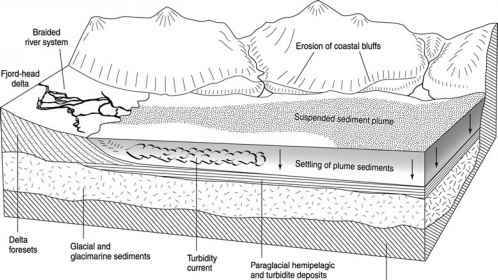 Sediments forming the breach are complex, with superposed moraines comprising couplets of bouldery basal and supraglacial melt-out tills, each couplet representing a glacier thinning/stagnation cycle (Fig. 15.12). Lateral morainic troughs were originally termed ablationsschlucht ('ablation valleys') by Oestreich (1906), and are features of many large valley glaciers. They separate lateral moraines from valley side slopes and act as gutters trapping slope debris transported by processes including rock fall, debris flow, snow avalanche and fluvial transport (Hewitt, 1993), and may contain ponds between debris cones. When ice levels are low, retreat of the proximal moraine slope may breach the moraine to capture the valley side drainage (Fig. 15.13). Sediments deposited in lateral morainic troughs have low preservation potential in areas of tectonic uplift, where they are rapidly lost from active slope systems. In the Karakoram Mountains, infills of lateral morainic troughs tend to be more complete further up-glacier, where lateral moraines are smaller and slope processes more effective at supplying material to the trough (Hewitt, 1993). An altitudinal zonation of slope processes, conditioned by decreasing temperature and increasing precipitation with altitude, is manifest in the depositional processes along very long lateral moraines which intersect more than one altitudinal geomorphological zone. At the altitudes of the lateral moraines of Europe and New Zealand, such zonation is less well expressed and fluvial processes are more important than in the greater ranges. 4. asymmetry may occur due to differences in glacier dynamics on either side of a valley. For example, a stable ice margin can build a large moraine, but if the other margin retreats, a series of smaller moraines will form. Total moraine volume may be the same on each valley side, but an impression of asymmetry arises because deposition on one side is more focused. How do terminal moraine and medial moraine evolve?